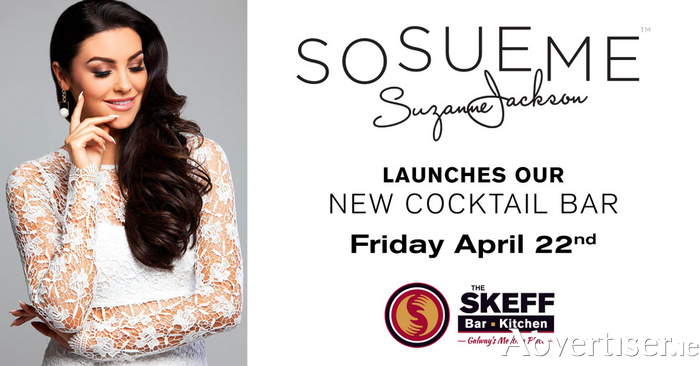 Named one of the world’s biggest digital influencers, Suzanne Jackson, founder of the SoSueMe brand will officially launch The Skeff’s new cocktail bar on Friday 22nd April. Boasting a new cocktail menu of 38 new recipes plus one signature cocktail designed by Suzanne, Galway’s official meeting place continues to impress with its range of nightlife activities. General Manager Brian O’Toole says the cocktail bar launch has a number of exciting elements. “We have actually invited our customers and social media community to suggest a name for our new cocktail bar and within a week we have over 110 entries. We are also launching a fresh menu with new tastes and mixology combinations, and finally we have invited one of social media’s most successful and influential bloggers to do the honours. Suzanne has also designed her own signature cocktail, which she will make in front of our guests. Professional rugby player Jack Dinneen who will also take over theskeff Snapchat account on the night will host the event. Page generated in 0.1970 seconds.